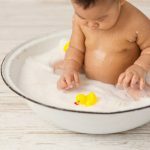 I had an excellent experience with Bambini for my newborn photoshoot. First, the studio was clean and welcoming. Then I was able to take the backseat during the whole shooting process as Illiyin, our photographer, handled our 14 days old newborn confidently. Most importantly the photos turned out great. Glad I did it with Bambini . …….bambini team was really experienced with how newborns react and behave. The environment was serene and calming paired with excellent photography skills and lighting equipment, not only were the results astounding, the experience formed a memorable time for us, the parents.